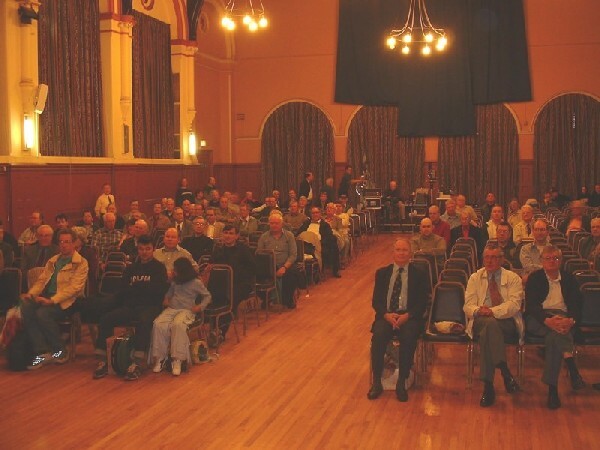 "VICTORIA HALL CINEMA AT THE 45th BFCC"
17th May 2003 proved a successful event. 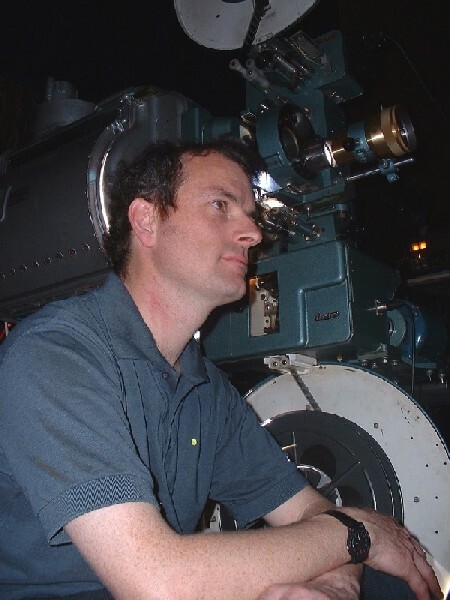 The star of the show was Ben Wales and his dual gauge 35mm/70mm projector (see his report later on this page). This attracted crowds of admirers all day. A major effort from Ben to actually get all the equipment to the BFCC just for the day. Our thanks to him for providing us all with such great entertainment. Another star attraction was the Super 8 screening of Jurassic Park with pulse sync' Dolby Digital 5.1 through the full Pioneer/Kef THX Ultra sound system. The big hall shook to the sounds of the T-Rex! Thank you to all who attended, to the dealers who make the whole event viable and to the whole BFCC team, in particular to Bob Maynard who always handles the busy ticket desk and promotion of the latest BFCC DVD/Video releases - details of these will be posted on the Filmtek page on this site. Plenty more pictures can be seen on page 2 and accessed by clicking on the relevant thumbnail image. Ben Wales with his dual gauge 35mm/70mm machine. This is the third screening I have done for the BFCC with the Westrex 5000 dual 35mm & 70mm projector, in the past events has seen some 70mm screenings, but for 2003 to mark the 50th Anniversary of CinemaScope a special 35mm (Fox Hole) 4-trk Magnetic demonstration was planned with Keith Wilton, the event organizer. The Westrex 5000 was designed and built in the UK in the late 1960’s, but it was too late to see many of them installed as 70mm equipment. 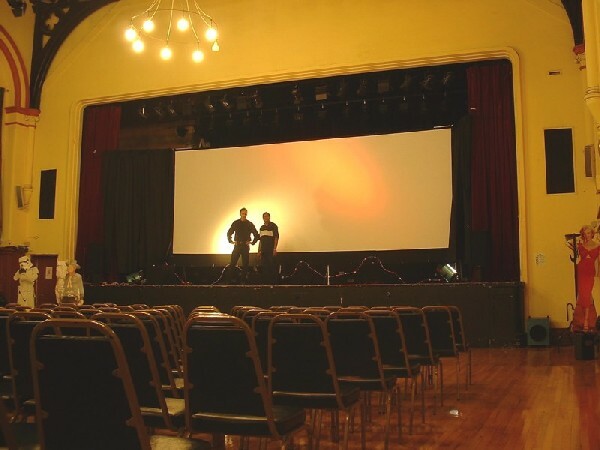 It was mainly independent cinemas that used Westrex at this time and only a handful of complete 70mm Westrex 5000’s were ever installed, many were 35mm only. The machine I own was built up over some years and completed in 1997, so far (I believe) this is one of only two remaining complete 70mm Westrex 5000 in the UK. To transport the projector, the base is mounted on a box section steel frame on castor wheels, the top and bottom spools arms are removed when in transit and any non- essential rollers etc are removed for transportation.. The Westrex 5000 is best described as ‘Transportable’ and weighs about 250kg without lamp house. 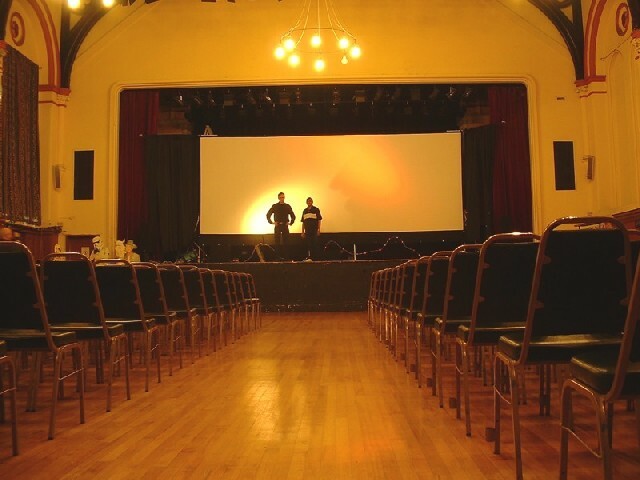 The Ealing screening needed a great deal of logistical planning and it needed almost a week prior of building and testing at home and the hire of a 3.5t van with a tail lift plus a assistant (Norman Warrick) helping with the moving and setting up on the day. The screenings required two 35mm picture ratio plates and correct lenses, one for 2.55:1 & 2.35:1 and for 70mm, also mono sound for the 2.35:1 and 4 & 6 channel magnetic sound for 35mm and 70mm. At previous BFCC events I used a 700kw Xenon Orcon Lamp house, but this was in a smaller hall, this time Keith said whatever we used it had to be at least as bright as his 1kw used in his Chinese portable 35mm machine, normally used at the convention. In response to this we set up a Peerless Xenon Lamp house with a 2kw Xenon and a single phase Orcon XP16S Rectifier and the results were stunning, particularly on a 35mm ‘Scope Technicolor reel from ‘Zulu’! It was hard work but it showed up there on the screen made all the more enjoyable and the appreciative audience gathered round the projector during assembly and the screenings throughout the day.